Finding part-time work whilst still at school is an excellent idea. This may seem daunting but support may be available. If you are happy to look just by yourself or with the help of your family, that is great. You can also ask your careers counsellor for advice in finding a Disability Employment Service. This service may be able to assist you in finding a job of a minimum eight hours a week. There are other ways to find a job or unpaid work experience whilst you are still at school. Ask your parents and other family relatives to help you. Work out all the community networks you are part of and see who might be able to help you find some work. You never know what might come up. 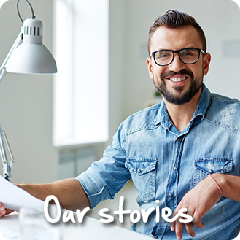 Click on Our Stories on the right hand side of the page or click here for personal stories about getting a part-time job while at school. Each state and territory has its own employment laws. You can find out the laws in your state on the website Lawstuff, just click on your state and then look at the On The Job - Employment section. One of the best indicators for future employment is to start working as a teenager. If you think that your son or daughter is in a good position to start a part-time job whilst they are still at school, this is an excellent plan. For ideas and other peoples’ experiences, do look at the video at the bottom of this page. You can chat to the careers advisor at school, ask if they know of anyone who can help. Read up on Disability Employment Services and get in touch with some, they may be able to help to find a part-time job. It is well worth starting the job search with your local community and your personal connections. Each state and territory has its own employment laws. You can find out the laws in your state on the website Lawstuff. Just click on your state and then look at the On The Job – Employment section. There’s a very useful page on raisingchildren.net.au about volunteering and paid employment for teenagers with autism spectrum. Here’s a video from Raising Children Network. It’s equally useful for parents of older teenagers and young adults in their twenties. You can get lots of good tips there about how to help your teenager look for part-time work.